In many of the small sketches he produced in preparation for Bathers at Asnières and A Sunday on the Island of the Grande Jatte, he necessarily reduced landscape to its essentials and he went on to employ this reductive process in his ‘marines’ where he somehow finds the poetry lurking within the banal. 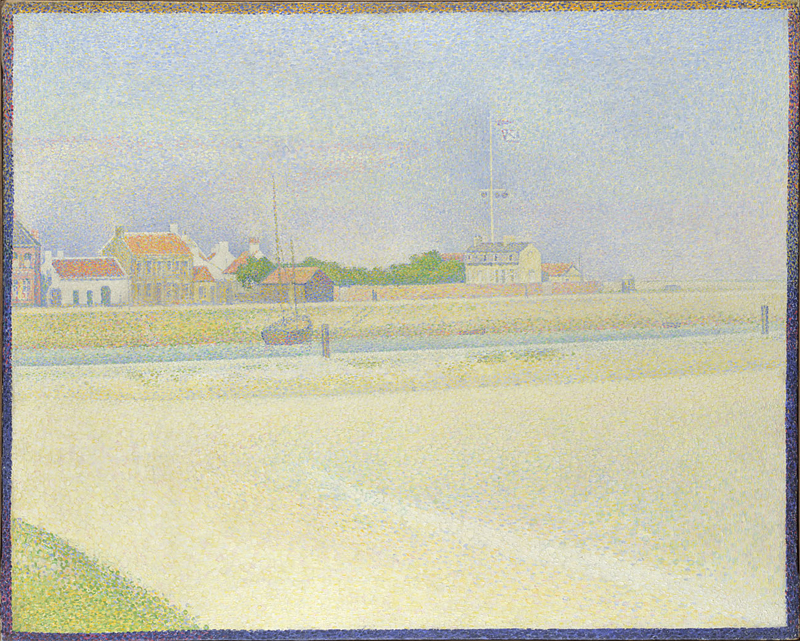 By 1890, in his paintings of Gravelines, Seurat attains a new level of austerity, deliberately choosing subjects devoid of all but the most unremarkable motifs. In The Channel at Gravelines nearly half of the composition is taken up with a sandy foreground almost totally without interest. A thin strip of blue denotes the channel, beyond which we can see some desultory dwellings and the harbour master’s house set against a nearly featureless sky. Colour and tonality have also been reduced to a minimum (if this was a photograph one would say it had been overexposed) the general pale blue and white scheme is relieved only by the red and purple points used in the roofs and masonry of the houses, and the green for the two areas of vegetation. Seurat’s use of subdued colour which he employed in many of his marines is evident in some of his earlier paintings from 1885 and 1886 but reaches a climax in this canvas. A general pallor has descended on the scene and an almost palpable sense of silence – no human interest disturbs the tranquility which is so profound as to approach an ominous oppressiveness. His increasingly rigorous pointillist working method seems to go hand in hand with this minimalist approach to content. In this regard his work was influential for such Symbolist artists as the Belgian Fernand Khnopff whose later painting of a post cataclysmic Bruges entitled The Abandoned City builds on the sort of atmosphere evoked by Seurat.